While growing up in a village in Singapore, Richard Tan and his brothers used to rummage through their neighbours' rubbish bins looking for discarded letters. They wanted the foreign stamps on the envelopes, which to them provided a small window on a much wider world. Several decades later, Mr Tan has turned that childhood hobby into a prize-winning collection worth millions. 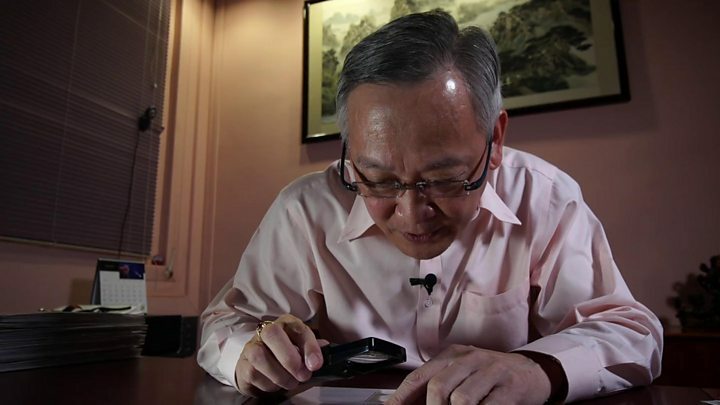 He's among an estimated 60 million rare stamp collectors globally - two-thirds of whom are from Asia. Their numbers are growing as an increasing number of people become wealthier and look to put their money into so-called alternative investments. Aside from stamps, other items that fall into this category include classic cars, art, wine, jewellery and even musical instruments. They've surged in popularity after recent global stock market routs spurred investors to seek other places for their cash. Private bank Coutts believes the days when investment portfolios consisted of just cash, bonds and stocks are "long gone". "At a time of paltry interest rates, we're seeing a lot of interest on the part of the wealthy in finding somewhere worthwhile and out of the ordinary to put their money," it reports. "Aside from the returns, these assets can bring a sense of excitement and the thrill of acquisition is a clear motivation for lots of collectors." British stamp dealer Stanley Gibbons has been expanding in Asia in recent years to cater to the growing number of affluent collectors. Set up over 150 years ago, the firm has also diversified its offerings to include the sale of coins, antiques and even rare books. The beauty of rare stamps and coins is their complete lack of market correlation, which is driven by the passion of high-end collectors spending money on their hobby," investment director Marco Kastor tells me. "So, in terms of periods of crisis, there is no effect on the rare coin or stamp market. "During the height of the financial crisis in 2008, the GB30 index [which tracks the prices of Britain's 30 most expensive stamps available on the open market] went up by 38% in one year. "We all know what the stock market did." China has been one of the fastest-growing markets in Asia recently, says Mr Kastor. Previously, China's leader Mao Zedong banned stamp collecting because he found it bourgeois. Now one of the most sought-after stamps is one that was commissioned by Chairman Mao called "The whole country is Red". It is supposed to show the red land mass representing Communist China - but the designer accidentally left the island of Taiwan in white. The stamp was immediately recalled but its potentially treasonous printing error has made it immensely valuable today. Those looking to invest in stamps can't just walk into a philatelic shop and expect to purchase something that will rocket in value. Stanley Gibbons says it comes down to several factors, including scarcity, supply and demand, quality and condition. The world's first postage stamp, the Penny Black, for example, is considered to be the Holy Grail for many collectors. First issued in 1840 during the reign of Britain's Queen Victoria, around 68 million of them were printed, meaning it isn't very hard to find one for sale. You can buy one for under £100. But an unused one in mint condition can sell for as much as £10,000. It has a face value of 13p but is worth £130,000 - again because of a printing error. There are only three copies in the world, with Queen Elizabeth owning two of them and the last in private hands. However, this is dwarfed compared to the "British Guiana one cent magenta" from 1856. It was sold at auction last year for a whopping $9.5m (£6.4m) making it the most valuable stamp of all. According to an index compiled by Coutts, classic cars are the best performing collectible. They have risen nearly fourfold in value since 2005. This is closely followed by rare stamps and coins, which are the only assets to increase in value over nine consecutive years. A separate report by Knight Frank found the worst investment to be antique furniture, with 24% returns over the past decade. However, financial planners warn that investing in collectibles come with risks. Aside from being pretty expensive options, many are highly illiquid; meaning your capital can be locked up for months or years before you find a buyer. Other hazards include the possibility of being tricked by forgeries, counterfeits, or just losing money on exchange rate fluctuations. "Art, wines, antiques, coins and stamps require analysis and advice from experts with regard to valuations and expected performance of such investments," says Sergey Titov from IPP Financial Advisers. "Such real assets have the risk of being damaged if they are not stored or transported properly so there can be storage and insurance costs to bear." Mr Tan keeps his stamps safely stored in a bank vault, only bringing them out for special occasions, exhibitions or competitions like the Grand Prix National. His office is a modest printing firm located in an industrial area of Singapore, and we've met there to take a look at some of his prized pieces. He focuses on stamps from the Straits Settlements, or former colonies across South East Asia, and has spent about £1.4m on the collection. The most expensive stamp he owns is from Borneo, bought at auction for £59,000 following a heated bidding war. I ask if there were any plans to sell the collection and give the money to his children. He pauses, before chuckling nervously. "I would hope that they will want to keep it." For him his stamps are not just about making a quick buck - and ultimately it is this passion for collecting that continues to give these little pieces of paper their real value. Video Is fine art a good investment?